On the heels of the 10th anniversary celebrations to mark a successful partnership between the University of New Brunswick and Furtwangen University (HFU) in Germany, UNB chemical engineering student Kirsten Melnyk was named UNB’s first-ever German Academic Exchange Service’s (DAAD) young ambassador for 2014-15. Kirsten Melnyk stopped for a photo in the town of Hechingen, where she worked last year. 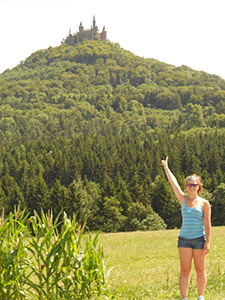 The castle is called Burg Hohenzollern and she enjoyed hiking and biking the trails in this area during her time off. Melnyk, who interned in Germany for about eight months, will leave this month to attend a training session in New York City along with the approximate 30 other young ambassadors selected from across North America. The Young Ambassadors Program recognizes students who have studied or interned in Germany in the previous academic year to serve as liaisons for DAAD in the U.S. and Canada. Each year, roughly 30 students from North America are chose to be young ambassadors. "The 10-year partnership we’ve had with Furtwangen University in Germany has culturally-enriched many of our students, our campus and our community at large,” said Tony Secco, Vice-President Fredericton (Academic). “It’s exciting that Kirsten has been selected as a DAAD Young Ambassador and we’re looking forward to her sharing her experience and knowledge with fellow UNB students this coming school year." As a DAAD young ambassador, Melnyk will learn more about intercultural communication, presenting and marketing. “My ultimate goal as a Young Ambassador is to reach out to students at UNB and share my experiences and knowledge in the hopes that they decide to either work or study in Germany as part of their university experience,” said Melnyk, who is also minoring in environmental studies and obtaining a diploma in technology management and entrepreneurship. From Tantallon, N.S., Kirsten knew she wanted to go away to university. “UNB is well known for its engineering program and after I took a tour of the campus, I knew UNB was for me,” said Melnyk. Melnyk belongs to a group of approximately 70 UNB students who have had the opportunity to study in Germany over the past decade because of this partnership. Michael Lederer, vice-president international at HFU says students have made it clear how important the exchange program is for the German university, both for their degree and for their future careers. Guida Bendrich, director of engineering and science co-op at UNB, says the participating students are the reason this partnership has been such a success. “Their ability to overcome challenges, build relationships and add value to the companies they work for have contributed significantly to our growth over the last ten years,” said Bendrich. “The partnership has provided each student with a unique experience which has contributed to their academic and personal development. I am personally looking forward to the next 10 years. According to Melnyk, her travels have just begun, but she does plan to eventually come back home. “My short term goal is to graduate from UNB with honors. After I graduate, my plan is to work internationally (Europe or Australia) for a few years and then return to Canada.” The Deutscher Akademischer Austauschdienst (DAAD) / German Academic Exchange Service is a private, publicly funded, self governing organization of higher education institutions in Germany. DAAD promotes international academic relations and cooperation by offering mobility programs primarily for students and faculty, but also for administrators and others in the higher education realm.